In my industry (asbestos removal and management), health and safety forms a large percentage of the work methods which we employ. Therefore, health and safety legislation forms a part of all businesses. In my own business, there is a significant amount of cost related to health and safety. Our staff must be fully trained in asbestos removal when working on site. The cost of this training (and annual retraining) along with the cost of specialist respiration equipment can easily run into thousands of pounds per employee. Then there is the additional cost of certification for training for working at height, for operation machinery such as forklifts; the list sometimes feels endless. Add these costs to the costs of specialist equipment such as negative pressure units and health and safety legislation can have a huge impact of the companies cashflow. In addition, health and safety legislation can impact the requirements for administration on the business. Every contract requires a specific set of Risk Assessments and Method Statements which described exactly how each contact will be conducted from start to finish. This requires a considerable amount of manpower and various other systems to administer. It is important to review a health and safety policy regularly (my company sets a revision date 12 months from the date of the current Health & Safety Policy) and revise it if and when new legal requirements come into force or new information is available which require new training for employees pending the introduction of new machinery, processes or substances, as necessary. 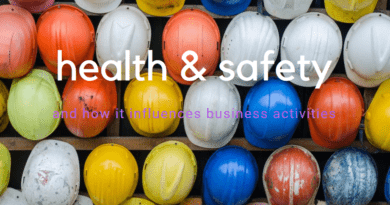 Within my organisation, it is the responsibility of the Managing Director to manage and review the organisation health and safety policy, which she does on a weekly basis within close liaison with the Health & Safety Executive.